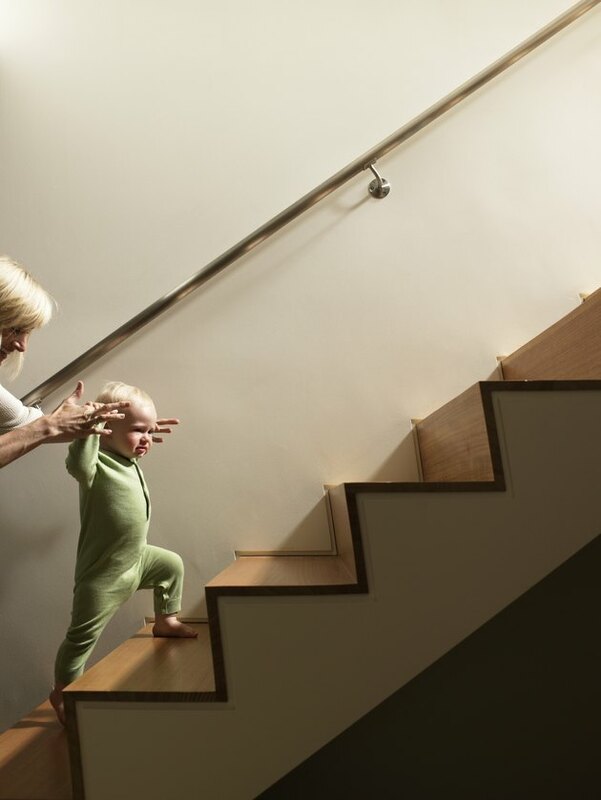 An efficient and time-tested way to traverse floors in a typical home is through stairways. Contractors who install them use the standards established in local building codes, which in turn come from the International Residential Code, or IRC. Requirements for the width of a stairway are among these regulations. A stairway of the correct width allows use by mother and child. According to the 2012 IRC, standard inclined stairways must be a minimum of 36 inches wide, starting from the permitted handrail height. The width must continue up to the minimum headroom of 80 inches above the tread or landing surface. All staircases with four or more risers require at least one handrail, which can project up to 4.5 inches on either side of the stairway. However, the minimum clear width of the stairway from the riser to the handrail must be at least 31.5 inches for one handrail, and 27 inches for two handrails. A spiral staircase may take up only half the room of a standard staircase, and, therefore, it is useful where space is an issue. It must follow the standards of all staircases, such as having at least one handrail, although there is one exception. The minimum clear width below the handrail is 26 inches. The standard clear width of 36 inches must continue from the top of the handrail to the minimum headroom height, which is 78 inches for spiral staircases. Bulkhead enclosure stairways provide access from an outside grade level, such as a lawn, to a finished lower level, such as a basement. They are exempt from the standard stairway codes, but only if they meet all of the following conditions: They must not be the only required exit from the building. The maximum height from the basement floor level to the grade level must be eight feet. And the opening from the outside grade level to the staircase must be covered by an approved means, such as a pair of hinged doors that swing outward. The Americans with Disabilities Act ensures that disabled individuals are able to function as independently as possible. It recommended modifications to building codes that are required for commercial and public spaces, but optional for one-family and two-family residences. While stairs are inaccessible to wheelchair users, they can still be negotiated by those with motion or sensory impairments. The only change the ADA makes that affects width is the requirement of two handrails rather than just one. The minimum clear width from these rails to the treads is 27 inches.